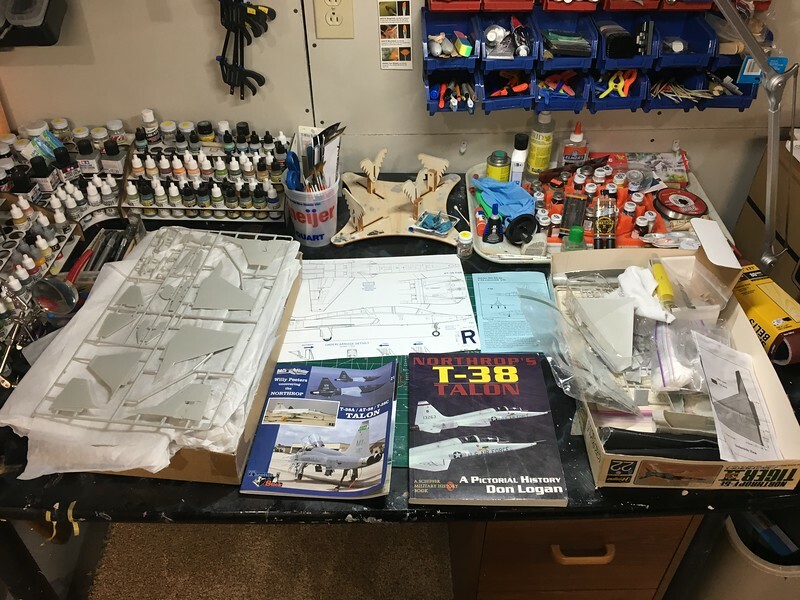 I've got 3 Hasegawa kits, 2 KittyHawk kits, the Belcher Bits F-5A conversion, The Daco book, and A Pictorial History of the T-38 Talon, cockpit shots from Peter Fleischman, plus my own walkaround shots from the T-38A at the Praire Aviation Museum. 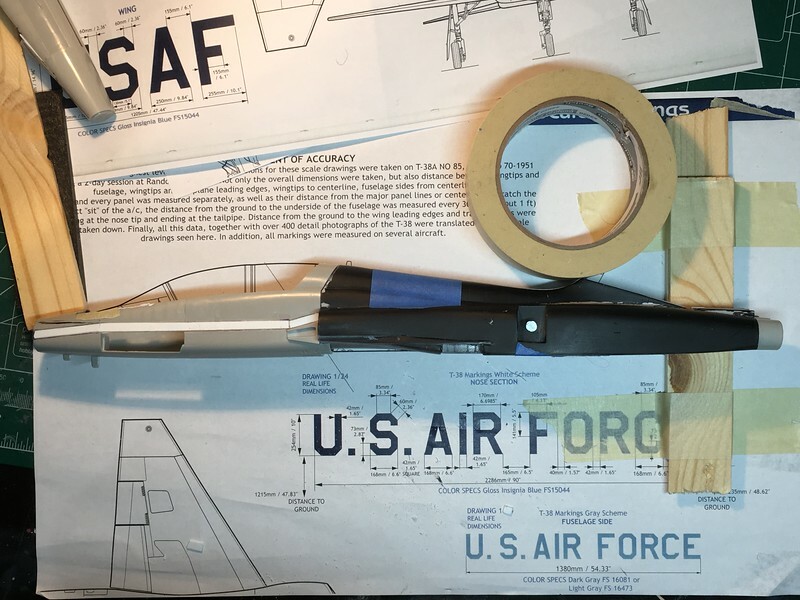 I learned how to scribe during the Fall so I plan to rescribe the whole plane to be accurate. 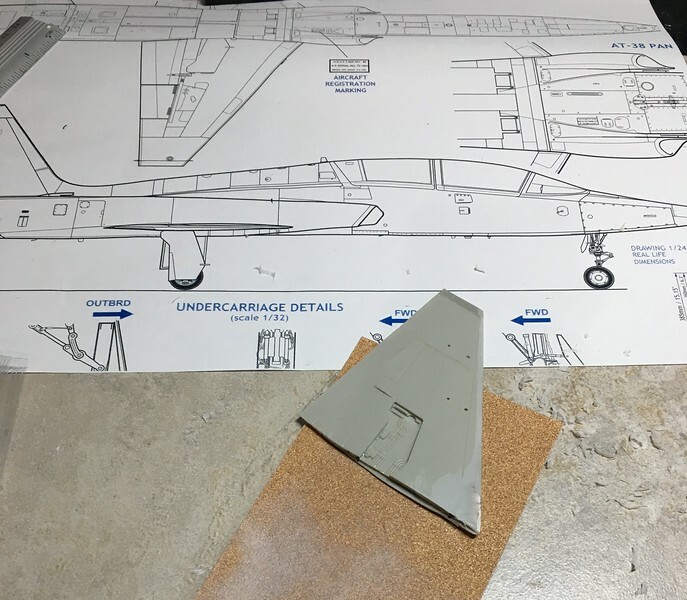 The wing profile is fairly different but the Daco book's scale drawings are perfect for setting the shape. the length needed extended so I cut up 1 set of wings and CA'd the tip onto the working set of wings. Then the profile needed updated. 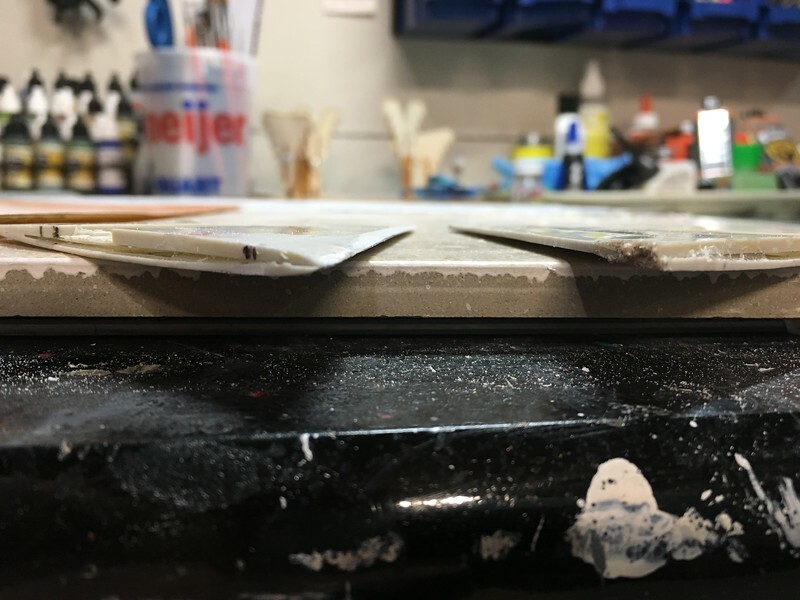 Mostly just sanding on a flat tile but had to really scrape off some plastic near the root to get the thickness correct. 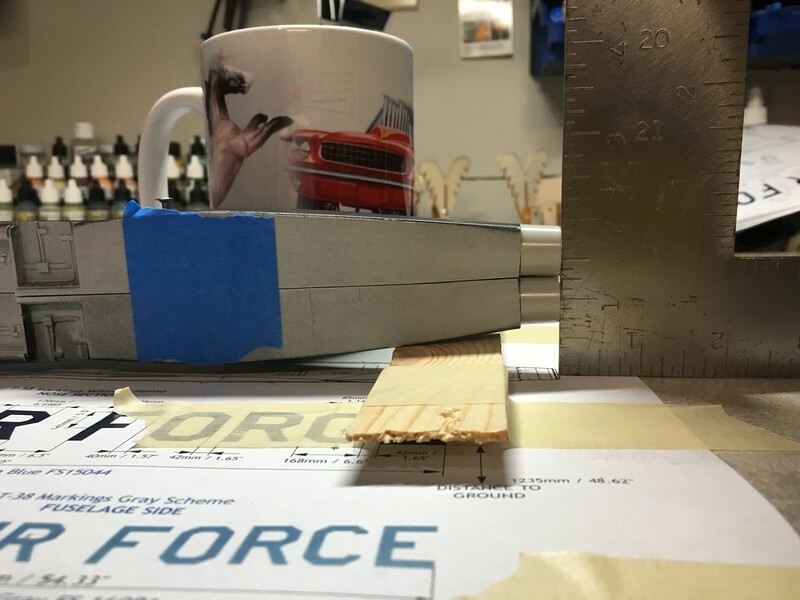 I filled the gap with sprue glue to try and get a consistent material for sanding the leading edge down. 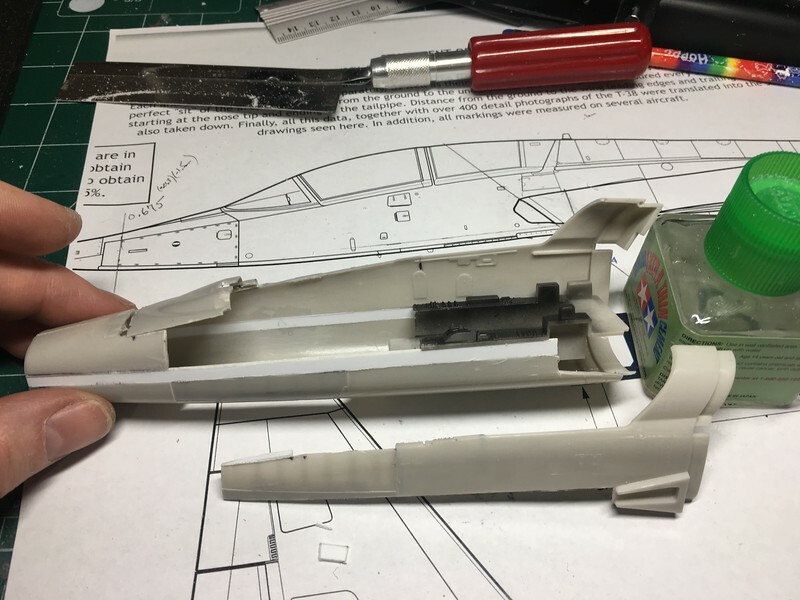 Next onto the intakes. I'm working on these today and could use some input. 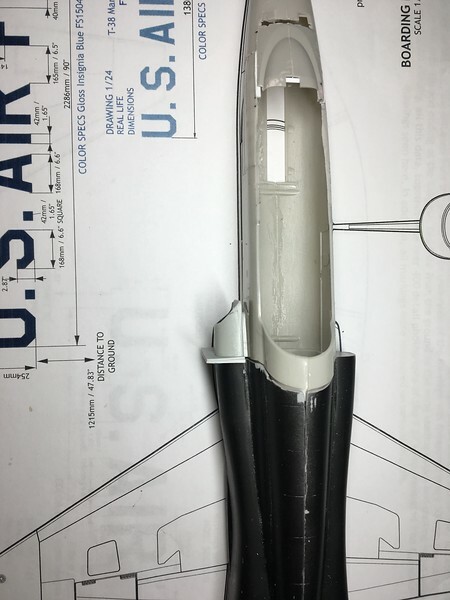 I squared everything up per the drawings and this gives me two options I think: check out these pics and hopefully it will help determine how to proceed. 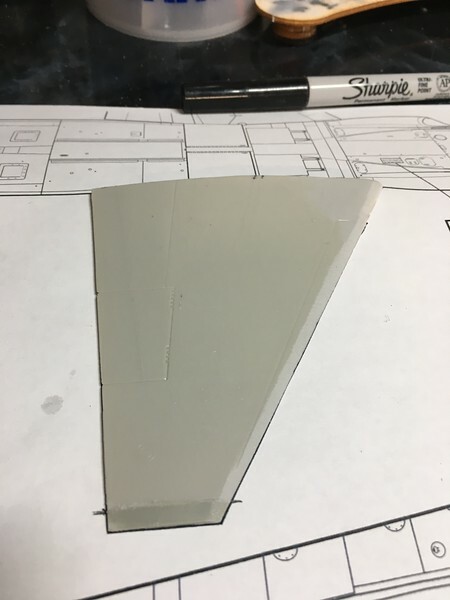 Option 1 - Looking at that last pic, cut the diagonal line across the intake at a point where there is enough plastic that I don't lose the shape of the intake on the leading edge. 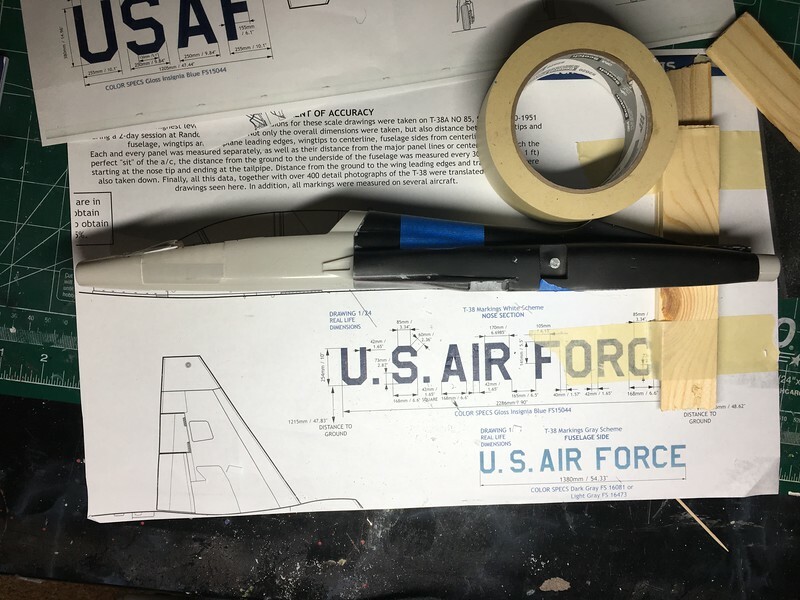 That leaves about 1/8" at the back where I need to make up the shape to the fuselage. 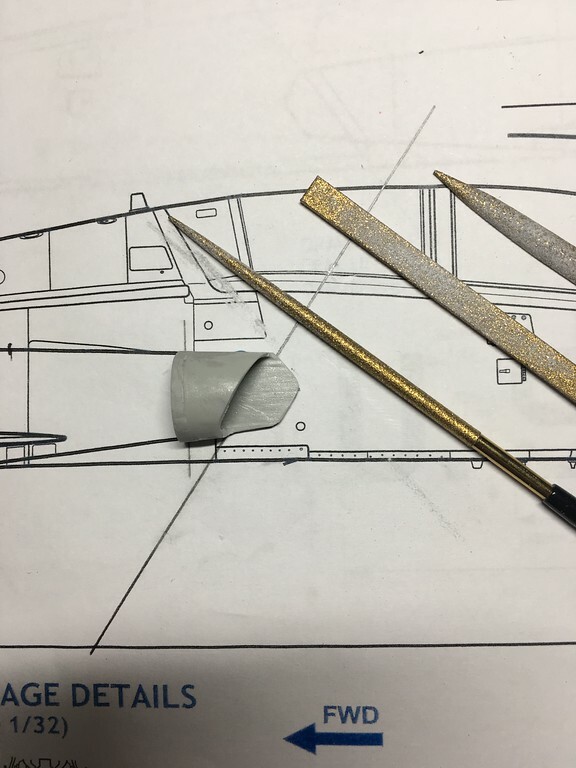 Option 2 - Mount the intake piece to the fuselage and extend the leading edge profile. 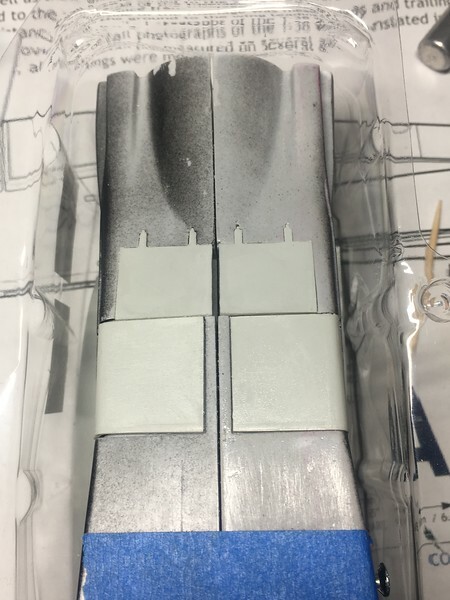 It will need about an 1/8" of material added to it on the outer edge away from the fuselage but the splitter plate looks like it will still be long enough that I won't have to modify it at all. Cracking start - another great subject for the Group Build - and quite a looker too! 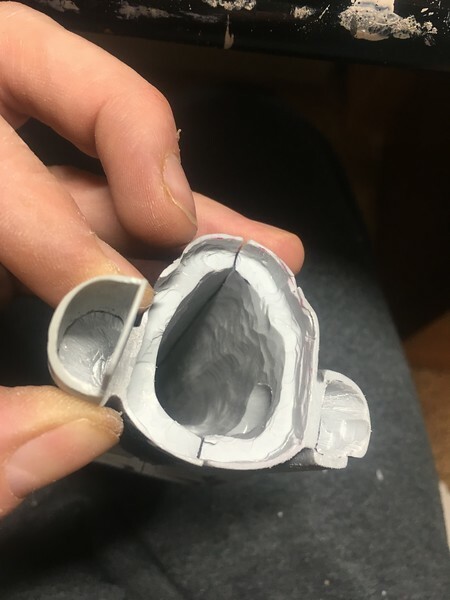 I extended the front edge of the intake to use as a guide for the razor saw. 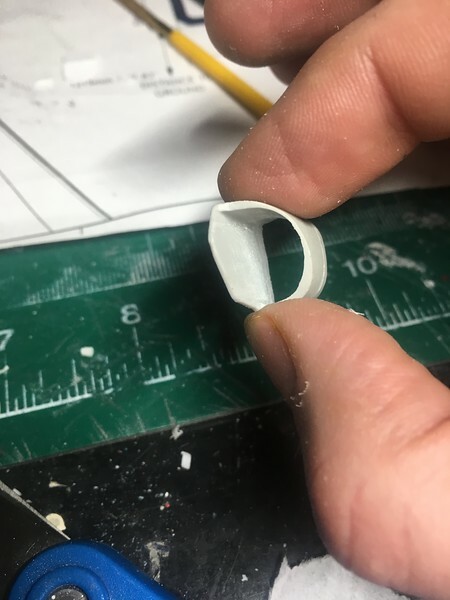 The cut doesn't extend to the bottom of the resin piece. 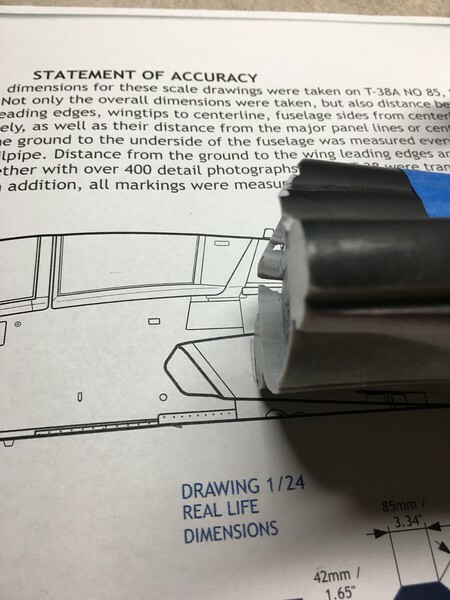 On the drawing and in photos you can clearly see a fillet on each end of the angled face. 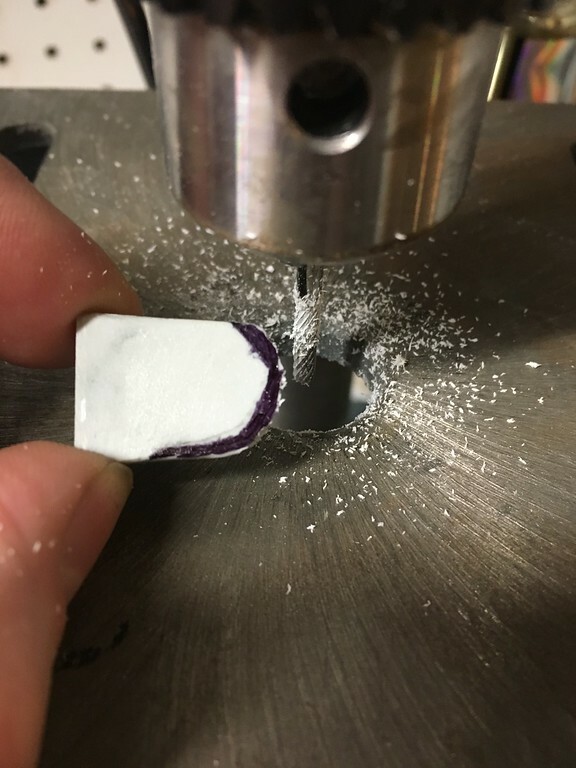 So what I did was drill a hole at each endpoint to make a smooth radius. Then cut in from a 90degree angle to seperate the pieces. 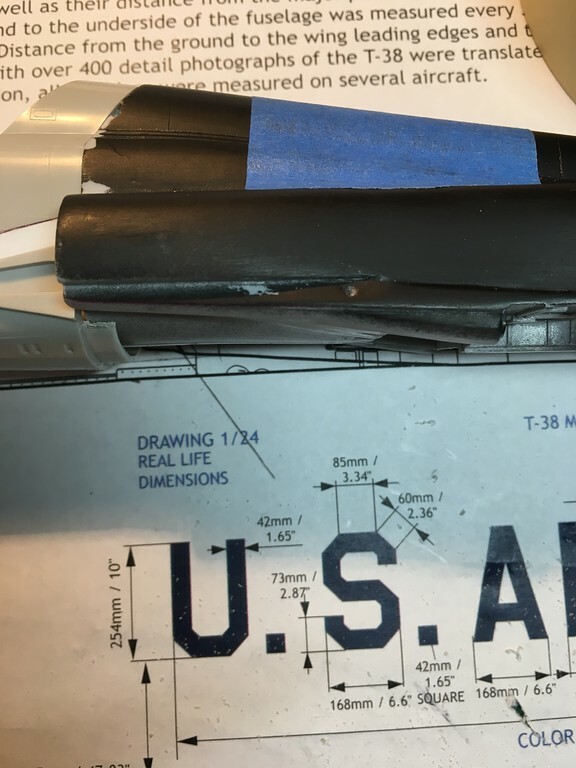 Initially I milled the large sections off but for the 2nd one I decided it was safer (for part integrity not me lol) to cut the excess off with the razor saw and then file down the resin to the edge of my sharpie marker shadow. Finished it up with my diamond files...And I present to you 2 perfect intakes ready for attachment! Nice work! 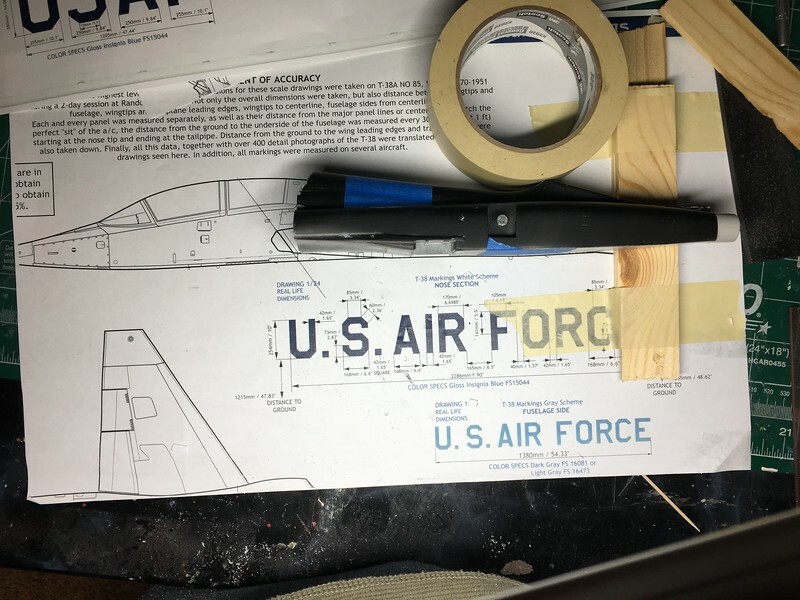 I saw the T-38 Birds perform at Monthan-Davis AFB in Tucson so will be nice watching this build! Great start, very nice work on the intakes! BiggTim I'm getting brave! 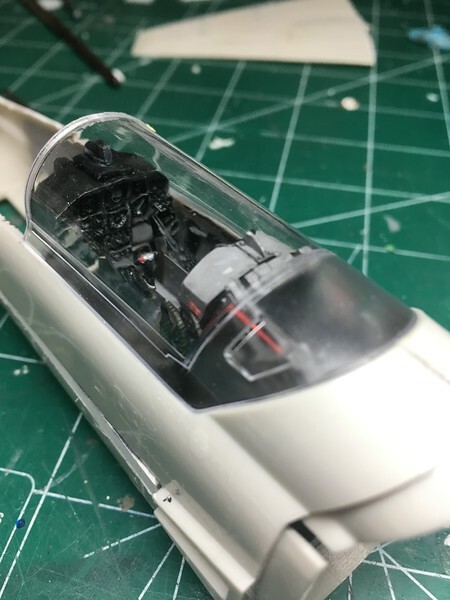 Decided to tackle the biggest profile issue with this conversion...which I wasn't expecting originally, but once it was laid out the issues people talk about with the cockpit being too shallow played out on the entire model for a conversion like this. 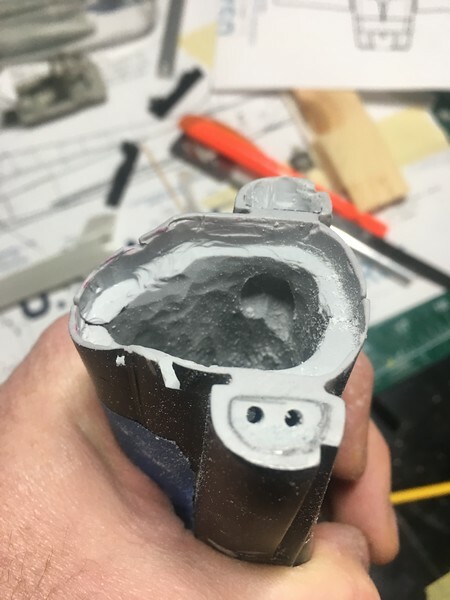 I had a few hours before my wife came home tonight and decided to see what the fuselage profile looked like under the cockpit. 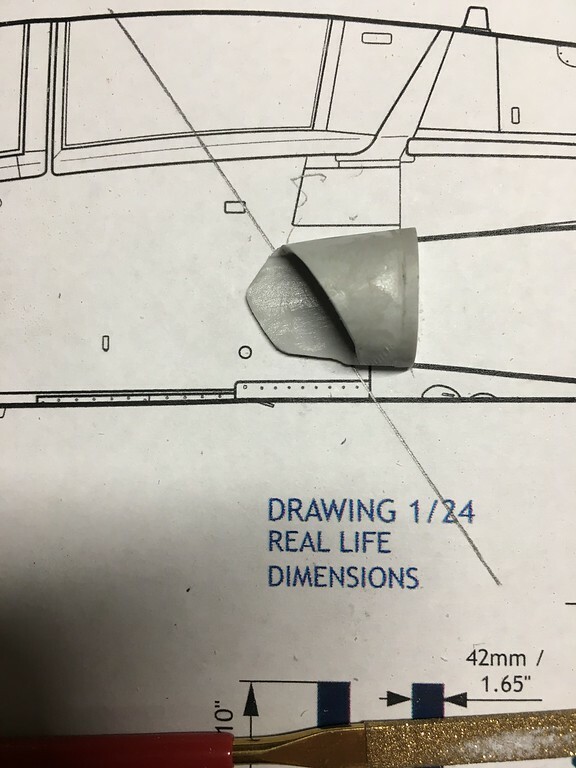 It appeared to be an even 4mm shallow. 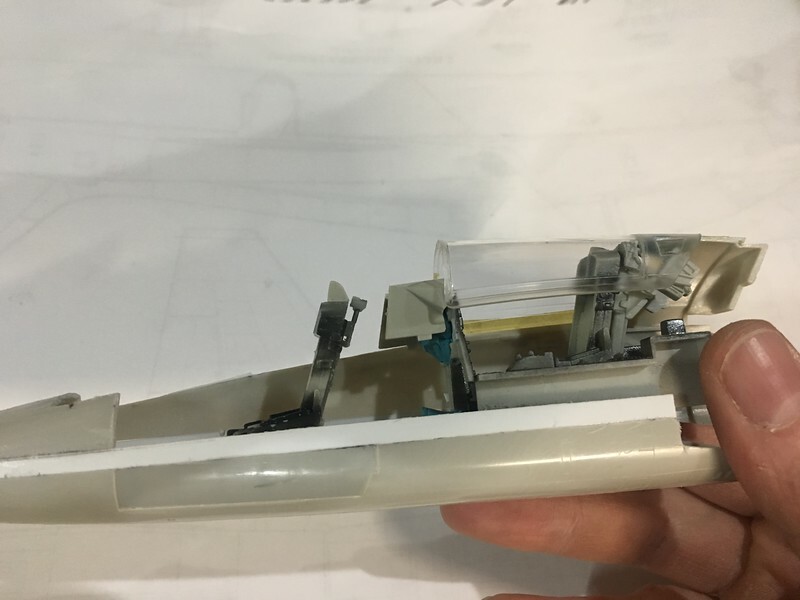 One thing led to another and since I had so much success with the intakes I decided to cut the fuselage in half. It helps that I have 3 of them for sure. 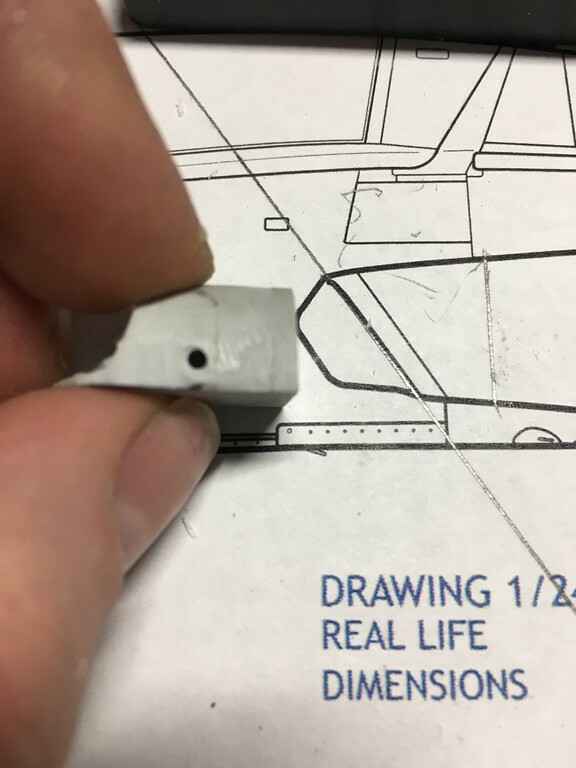 The drawings show the sides as really straight so I found a location where I could go straight down the body line and started sawing. These last 2 show the remaining gap at the bottom. I think I can fill from the back of the air brakes forward to get the shape right and everything will match up pretty clean. I learned where to make the cuts with this one. Over to the intake strake and then down instead of up. Otherwise the strake ends up in the wrong place and won't line up. Also I think the nose is 1/2 or 1mm too thick. For the final version I will taper the spacers from 4mm at the intake to 3mm at the nose. So let me know what you think, respectable match isn't it? Very nice! 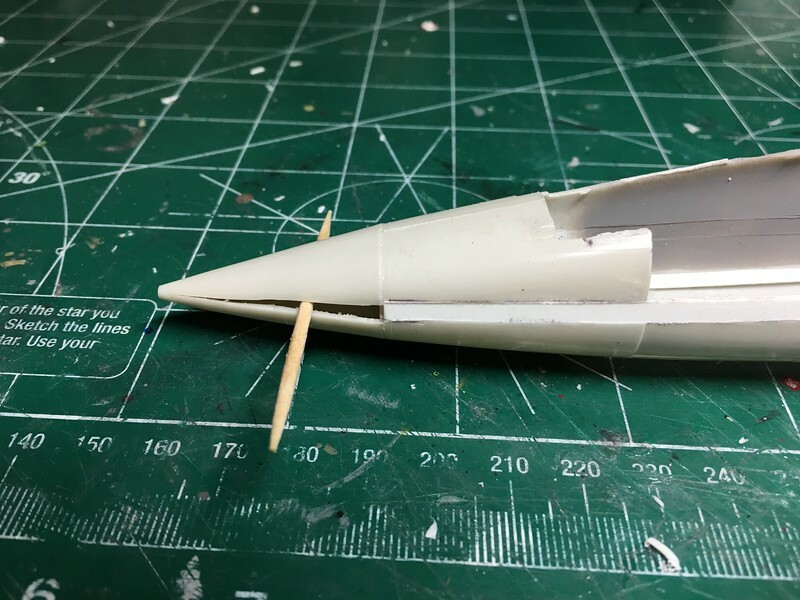 What plans do you have for the rear fuselage? 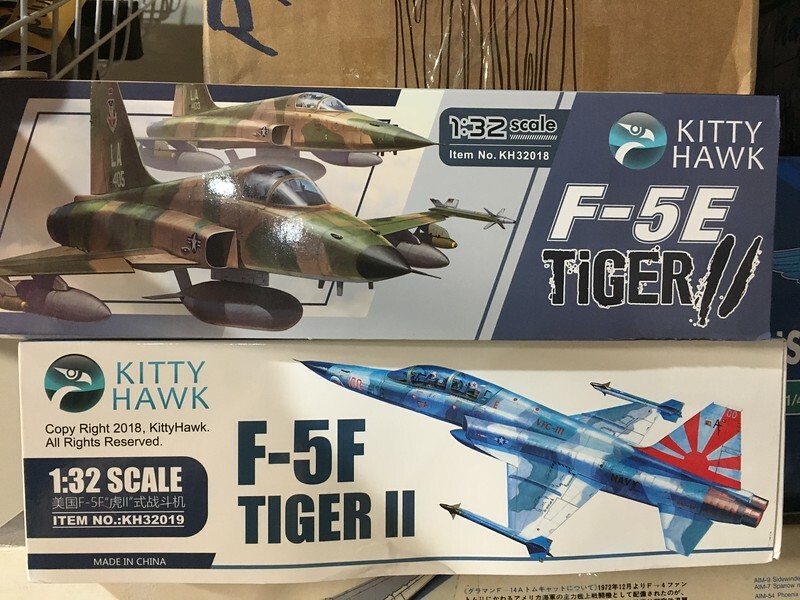 The T-38 was more like the F-5A than the F-5F in the area around the base of the fin. Awesome work! This is the kind of thread LSP is all about. That must have been awesome under those big skys! I grew up with Talons and Skyhawks as the demonstration teams of the day and I think half the time Cleveland OH was overcast. Oooh, side benefit (pun intended) to this extra work is that I could also make a cutaway of the final version. 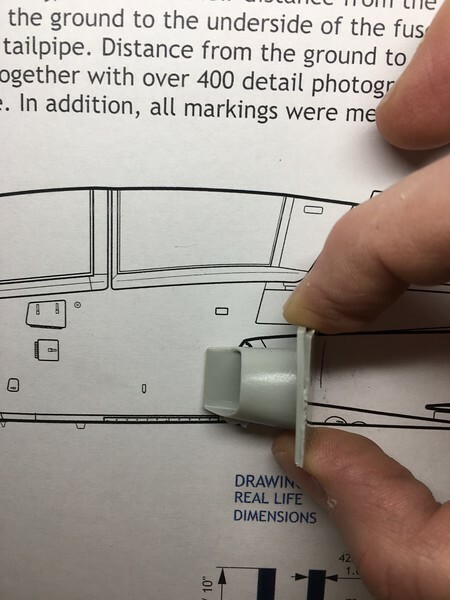 Fitting the cockpits is now going to be super easy!! hmm like your "approach" to the subject, very nice. Anxious to see the end result, have fun. Thanks Jack. Anytime I can make something myself I'd say it's FUN for sure. Didn't do much except work at my bench today...no laundry, one run out with the kids, ordered dinner, you'd think it was winter out or something. Where to start, guess we'll take a random order based on stream of consciousness. Once the final front fuselage was cut and reassembled the level of the seats had to be set. She'll be in-flight so the air brakes and gear doors needed trimmed and fit. For not being made to close they line up pretty well. Back to the rear cockpit. Opened up the Daco book again and tried to simulate the rear IP. Here it is mocked up. 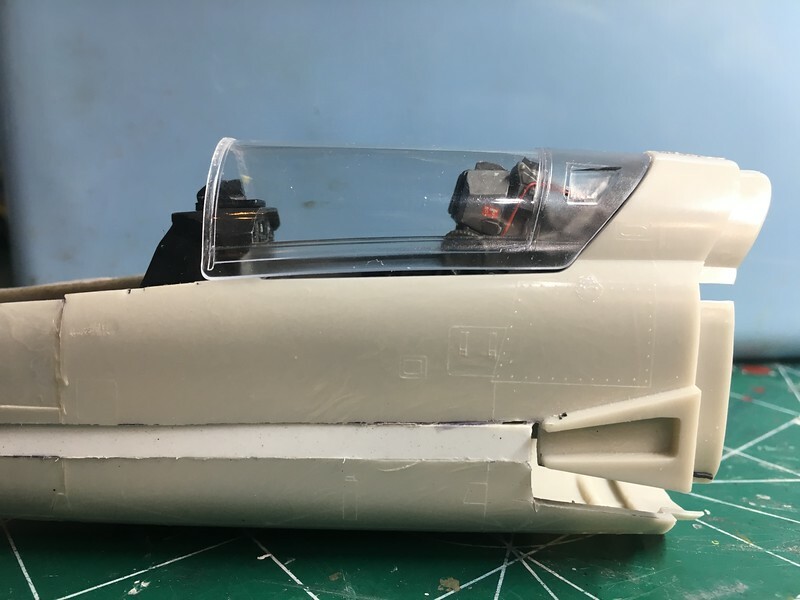 Then I took the coming between the cockpits from the F-5F kit and made up one based on the IP and canopy that I have. Once it's dry tomorrow It will get sanded and then it's painting time. Last I wanted to have the intakes open so that you aren't looking at a blank panel every time. 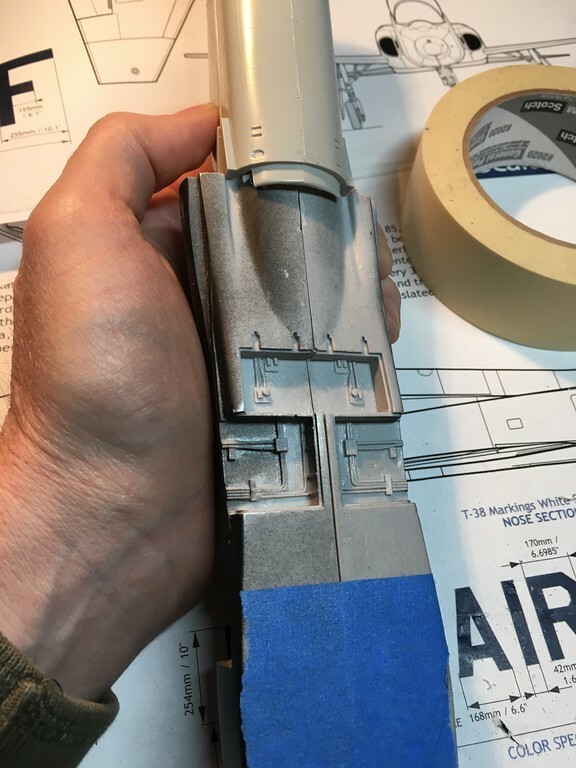 Given the small diameter of these intakes I don't plan to put a fan inside the fuselage but who knows I may test something out just to see if my thought that it's too small is true. Lots of little, boring stuff going together lately. I've got the main bay covers on now, the lower wing scribed and sanded the auxiliary intake covers fitted and misc pieces aligned. 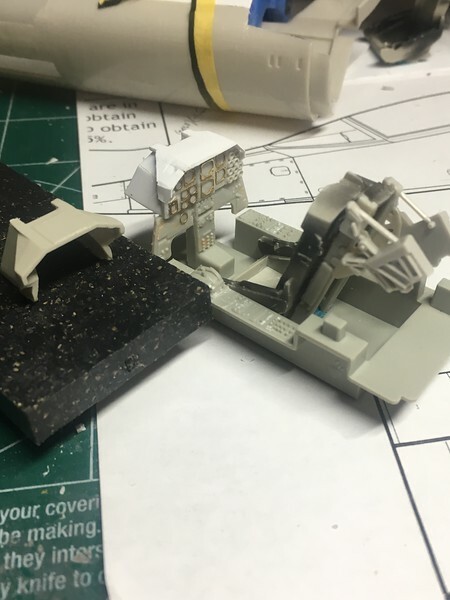 Yesterday and today I worked on assembling the cockpit so I thought to share progress. To keep the shape of the nose I cut almost through it with a razor saw. Looks like it should be one of those African nose piercings doesn't it? ...and a shot of the IP work I've done so far - just through the mock-up canopy for now to get a feel for how it's going to look.